It is our ignorance and naivety that made us vulnerable to malevolent alien manipulation. We are not alone; we’ve never been alone! Humanity has been kept in the dark for ages hence the name (the dark ages); it is done on purpose to keep us helpless and confused so that we would not realize the truth and face our problems to put an end to the chaos surrounding us. They have been with us for thousands of years; they keep us busy fighting each other, so they would harvest the negative energy produced through fear, pain and suffering from wars and devastation. They bribe, reward or threaten those in position that could help them accomplish their agenda while safe guarding their secrets. They use our societal systems to introduce new diseases, famine, drought, natural disasters, wars and pollution to keep us from finding our true purpose in life. They kept themselves in power by allowing only few groups of people to understand the knowledge of their inner truth and by that they created a hierarchy of separation which is plaguing our world today. People’s cynicism, religious beliefs and disregard to any idea different than their own made it easier for these nonhuman aliens to continue operating behind the scenes as the shadow governments; they use the elected governments like puppets. As long as humans stay ignorant these negative alien beings will stay safe from being discovered. No one dares to stare at the truth! Because once it is seen, people are obligated to deal with it. President Ritchard M Nixon saw the people's flaw! Leonardo da-Vinci is trying to tell us that we are blind to see the truth. 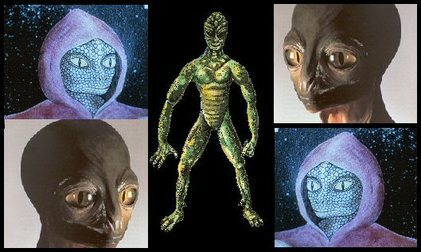 Researchers of extraterrestrials call these beings the reptilians because in their true form they do look like reptiles. If we look at all indigenous cultures around the planet, they all referred to the idea of dragons, and serpents as the creators of life. Why do you think the symbol of the medical profession is depicted as two snakes wrapped around a winged staff? Or why the dragon symbol is very important to the Asian community? The Reptilians are an ancient race and master geneticists highly skilled in the genetic organization and manipulation; how many times have you heard someone say something about the human reptilian brain?! That is because our human DNA contains in part a reptilian heritage; but it also contains a cocktail mix of other alien DNA from around the universe hence the different appearances, shapes, colours and blood types of humans. People can bury their heads in the sand all they want, but sooner or later the truth will be evident and reveal itself even to the most opinionated and stubborn individuals on the face of this planet. The world is waking up to see that what we were brainwashed to believe in a matrix that has been designed for us by them not by us. They used our belief in a system they designed to create our reality; because belief creates reality. One very important piece of information we must understand, is that we are a multidimensional beings which means; we exist as human beings in this version of ourselves, but we could also exist as one of these extraterrestrial beings in another dimensional version, or a different life form in a yet another dimension all at the same time; the possibilities are endless. Statue dug up by archaeologists in Iraq. The site is 7000 yeas old. The Dragon is associated with power and wealth in the Asian culture. Our connectedness to these beings physically and non-physically creates a piece of life’s puzzle which we must unlock to move forward into an advanced level of awareness. It is difficult for anyone of us to comprehend the complexity of life, the universe and the web that weaves everything together. People without open mind would find themselves stuck, unable to expand their mind’s comprehension of anything beyond their five senses, they refuse to open up for any new information or ideas brought forward that contradict anything they have learnt. How many of those close minded people are discoverers of anything at all? They are the ones who prosecuted the pioneers of new ideas and discoveries. There are also many wonderful, loving and kind extraterrestrial benevolent beings helping humanity at this time and waiting patiently for the day where we could have a peaceful planet so they could openly communicate with us without confrontations based on ignorance. But we must also understand that the Reptilians are not the only type of negative malevolent Extraterrestrials with agendas here on earth! Humanity has so much to learn, we act as if we know it all but there are so many things we claim we understand that are based on false assumptions. In the scope of things our understanding towards our universe is similar in a way to the kindergartner’s comprehension in comparison to a PHD level of university. Planet earth is a living sentient being, we were supposed to be the stewards and the care takers of this magnificent planet; but what are we doing? We are acting like a disease and call it progress! How many times did our hearts tell us that things are not right in this world; but we ignore our hearts and believe the misleading information fabricated by those in positions of power?! Our egoic mind would take over and say these people claim they are experts, so they must be right! When are we going to start operating from the heart and stop following the manipulative ignoramus of the world? Haven’t we had enough?! Our entire life’s energy of hard work and labour are being spent on weapons and war instead of exploring the stars, making new other worldly friends and discovering new life and new civilizations! Where are humanity’s dreams and ambitions going? We are not here just to work, eat, have kids and die! There is so much to be discovered and new possibilities that are becoming reality. Everyone must stop listening to others and start to think for themselves. True Leadership is described as someone who does wonderful things and inspires the world to do the same; but those who sit on a throne ordering people to obey skewed laws, are nothing more than just dictators stooped in egoic ignorance.